Legend has it that Alexander Hamilton, the early American statesman, gave the Outer Banks its colorful moniker, one that over time came to romanticize what mariners once dreaded. According to author Ben Dixon MacNeill in "The Hatterasman," published in 1958, Hamilton "passed Cape Hatteras on a summer night in 1773 and thereafter remembering the night's terror, he spoke of that portion of the sea as the Graveyard of the Atlantic." Hamilton's story was a creation of the imaginative MacNeill, said Kevin Duffus, author of the 2007 "Shipwrecks of the Outer Banks, An Illustrated Guide." "Unfortunately," Duffus said, "many, many writers and historians have repeated this." Over the years, "Graveyard of the Atlantic" has come to broadly describe the area where an extraordinary number of shipwrecks are scattered off the waters of the Outer Banks, or more correctly, off the coast from Cape Henry to Cape Fear. Hamilton, who as U.S. secretary of the treasury under George Washington encouraged construction of coastal lighthouses, was on a vessel heading from the West Indies to Boston at age 14 when the ship caught fire. 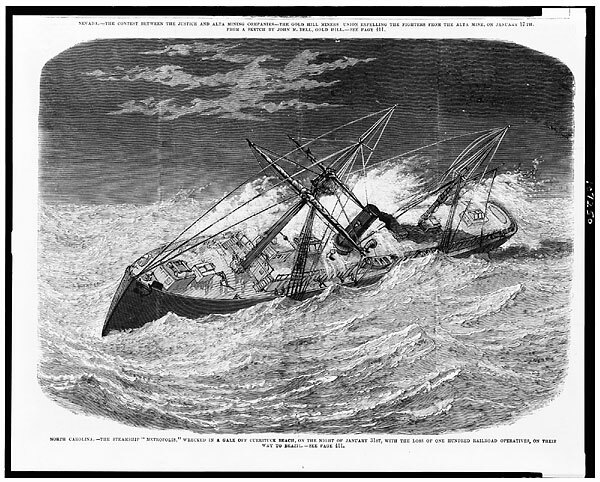 But there is nothing in historic records indicating that Hamilton was off the coast of Hatteras when his boat caught fire, Duffus said, or that the ominous description can be attributed to him. "Nowhere in Alexander Hamilton's personal writings did he ever say that he was in danger of being shipwrecked off the Outer Banks," Duffus said.